The fact that Bob Dylan became a Christian is still very much controversial among many of his fans. It is not too much to say that when he began recording directly evangelical, even apocalyptic evangelical albums of rock music, beginning in 1979, he delivered a shock comparable to that delivered to the folk movement in the mid-60s, when he so famously “went electric” and induced that old Communist Pete Seeger to threaten power cords (chords?) with an ax. It is well to remember that Slow Train Coming, the first overtly and emphatically Christian album, came but a few years after the revival of Dylan because of the greatness of Blood on the Tracks and Desire, wherein he showed signs of a revival of his old folk roots. Still, it is a puzzle to me how the singer of “I Dreamed I Saw St. Augustine” (1967) could ever really shock somebody by being discovered a Christian. The evidence of Christian themes and imagery dates from the mid- to late-60s; and the borrowings from Biblical ideas date from his earliest songs. The final fact is that Bob Dylan, by becoming an unabashed Christian in song and statement, and yet still churning out some pretty impressive music, is an inducement to shock and outrage for many Americans. His overtly Christian phase began in the late 1970s; three albums of evangelical rock followed. They were uneven, but showed flashes of real brilliance. There has been no repudiation since (though countless evasions and ambiguities), and virtually every subsequent album has included spirituals, prayers, recitals of biblical stories, or applications of biblical themes. Bob Dylan’s career arc is not for me (as it is for my father’s generation) memory but history. And to me it is plain as day that history will record Bob Dylan as an American Christian artist of the first rank. 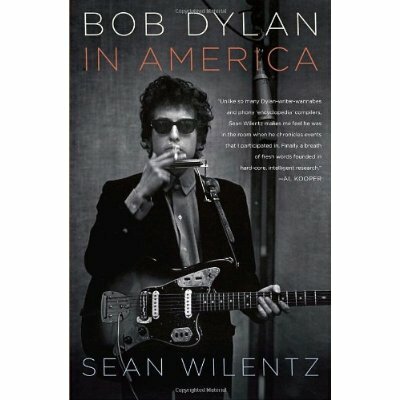 To his credit the liberal historian Sean Wilentz’s recent book Dylan in America does not for a moment entertain the absurdity that Bob Dylan’s religion is insincere. The book does not dwell at length on the fact of Dylan’s belief in the God of Abraham and St. Paul; but neither does it indulge the usual liberal instinct to turn away from a hard fact. On this vital point it is mercifully free of the writer’s particular cowardice of euphemism. Chesterton said that short words startle the euphemist, while long words soothe him. Say to him that Bob Dylan is a bible-thumper and he will sit up sharply; say to him that Dylan, as singer and showman, and inheritor of various American traditions, is possessed by a very vivid and complex spiritual cosmos, which his social-justice topicals demonstrate with particular vehemence — say this and our euphemist will lull off like a babe. Since Mr. Wilentz is the first liberal (that I know of) to treat Dylan’s Christianity with real veneration, I am inclined to think his book a watershed. But that is mere conjecture. What is fact is that the book does solid work with the tools of modern historical research to flesh out the story of Dylan and his songs, which in addition to being a story about America is also the story of a remarkable minstrel’s interpretation of the Christian revelation through American eyes. Wilentz’s chapters on “Delia,” “Lone Pilgrim,” and “Blind Willie McTell” are fascinating divagations into America lore. Each evidences real scholarly talent. Personal recollections (the author’s family ran an influential book shop in Greenwich Village in the 1960s) are shrewdly introduced throughout. Blonde on Blonde being his favorite Dylan album, the present reviewer was somewhat unduly absorbed by the chapter on that masterpiece’s process of creation, which makes a heroic effort to distinguish which musicians appeared on which song, and how each song developed from antecedents. Of course the pretense that Bob Dylan deserves study and scholarly assay like any great artist is itself a contentious one. I expect that the fact that I share with Wilentz the view that he does, is probably a mark against my sanity for many readers of this blog. So be it. I stand by my judgment. Bob Dylan’s contribution to American culture, his stark rendering of it in all its richness and peculiarity and occasional squalor, above all his searching exploration of the unique Christian culture of America, is a treasure of incomparable value. Wilentz’s book is a solid if limited study of that treasure. "Someone's got it in for me. When they will, I can only guess." I'm probably in an eccentric minority on this topic, but I have never admired the compositions of Bob Dylan, neither words nor music. And, to my ears, the sound of his voice is like chalk on a blackboard. I agree about the Christian themes in Dylan's music from very early on, though I think it is a leap to call him an "American Christian artist." Amy Grant is an American Christian artist. Dylan is just an artist, one who went through an overtly Christian phase for a time (in which he recorded some decent songs, though probably not among his best)and has Christian themes throughout his recorded work, as well as a lot of songs that criticize a certain kind of American Christianity (e.g. "With God on Our Side", or even "Slow Train Coming"). P.S. In this clip from "Don't Look Back," when asked if he is religious, Dylan says he doesn't believe in anything. To clarify, I certainly do not claim Dylan as anything like an orthodox Christian teacher. Whatever his own theology is, I have little doubt that on many points it differs from mine. The strong chance is that the man is a stark shining eccentric. A friend of my insists, not on "Christian," but on the somewhat more enigmatic descriptor of "Biblical" -- Bob Dylan is a Biblical American artist. Dylan is just an artist, one who went through an overtly Christian phase for a time ... and has Christian themes throughout his recorded work, as well as a lot of songs that criticize a certain kind of American Christianity (e.g. "With God on Our Side", or even "Slow Train Coming"). The only part in that I would object to is "phase for a time." Otherwise I agree. But the suggestion of a fleeting or evanescent "Christian phase" cannot explain such powerful Christian songs as "Red River Shore," "Spirit on the Water," or "Cross the Green Mountain" -- all recorded long after the overtly evangelical stuff as done. Nor, again, can it really explain earlier songs like "I Dreamed I Saw St. Augustine," or "New Morning," not to mention "Tangled Up in Blue," or even "Chimes of Freedom." To repeat, none of these songs reaches the auditor as an orthodox rendering, properly so called, of the Christian witness; but the authenticity of each as springing from a desire to do just that, to accomplish a true rendering by striking and novel and unforgettable methods, is evident. It should come as no shock to anyone who loves great music that Bob Dylan became a Christian. There are many other examples of great artists who are also Christians but did not necessarily begin as Christians. Johnny Cash, Bono, Sam Cooke, Lou Reed and possibly the most interesting, Nick Cave, who started Nick Cave and the Bad Seeds. If you want to hear an amazing song, Christian or not, try "There is a Kingdom" by Nick Cave. The fact that Dylan is also Jewish is not surprising either. I wish every devout (and secular) Jew would read the New Testament and also "The Case for Christ" by Lee Strobel, which supports the authenticity of the new testament. I think it is a logical step and one which hopefully can be taken with much joy for as many Jews as possible. After all, Jesus actually 'belongs' to the Jews as much as he 'belongs' to Christians or anyone who lives like a real Christian. That is, lives as Jesus did. Bob Dylan's music helped get me through a somewhat difficult childhood and I pray for him every time I hear his music.